I’ve been collecting postal artifacts related to libraries for more than 17 years, and I’ve been exhibiting these artifacts at stamp shows since 2003. In 2005 I realized that I had accumulated enough items with a connection to the American Philatelic Research Library to put together a one frame exhibit of the items. 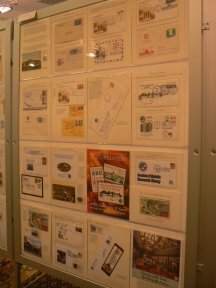 I showed the exhibit for the first time on a non-competitive basis at StampShow 2005 in Grand Rapids, MI. More recently I’ve been including my APRL postal items in a three frame non-competitive exhibit titled “America’s Philatelic Libraries & Museums”. At the WISCOPEX stamp show on April15 in Madison, WI I went back to a one frame exhibit which is titled simply “The American Philatelic Research Library”. Part of my purpose in showing the exhibit was to help promote the current efforts to raise funding to relocate the APRL in an expanded space in the American Philatelic Center. I will also be showing the exhibit at the Rocky Mountain Stamp Show in Denver in May. I hope to make the exhibit available to other stamp shows that allow non-competitive exhibits in the future.